Heavenly blog! : No. 1242: Now is the time that Jan Aage Torp resigns as "Pastor" and "apostle" before God himself will depose him! No. 1242: Now is the time that Jan Aage Torp resigns as "Pastor" and "apostle" before God himself will depose him! Now is the time that Jan Aage Torp resigns as "Pastor" and "apostle" before God himself will depose him! Joh. Revul. 2. 2 I know your deeds, your hard work and your perseverance. I also know that you can not tolerate evil. You have tested those who call themselves apostles but are not, and you found them liars. 2 Cor. 13. 1b. After two or three witnesses shall every matter be settled. 1 Tim. 3. 1. If anyone would like to have a supervisory service, it is a valuable task he wants. 2 An overseer must not be accused of anything. He must be husband of one wife, sober, prudent, courteous, hospitable, able to teach, 3 not a drunkard or violent, but gentle, without contentiousness and lust for money. 4 He must manage his own family in a good and honorable manner, having his children. 5 If he fails to manage his own family, how can he take care of God's church? Rom. 2. 21 You will teach others, do you not teach yourself? You who preach against stealing, do you steal? 22 You who say that one should not commit adultery, do you commit adultery? You who abhor idols, do you rob temples? 23 You who are so proud of the law, do you dishonor God by breaking the law. 24 It is written the name of God is blasphemed among the Gentiles because of you. God's words "shotguns" against Jan Aage Torp as unfit to be Shepherd! Had no plans to write more about Torp, but here it is obviously necessary when he wants to be first. We see it also in the so-called child welfare case with the Norwegian / Romanian couple. They admitted violence etc. Therefore CPS their concern not incorrect, although they certainly did not need to place children away before their parents had received a call that a lot had been put in place. But what makes Torp? Only he comes in "sun" so he can drive with quote cheating and everything else, only he is in the center as the narreisten he is! Although these cases will Torp turn "heads or tails of." Normal people had never stated philosophy about this when they had been so ashamed and sorry for having "terrorized" own children obviously! 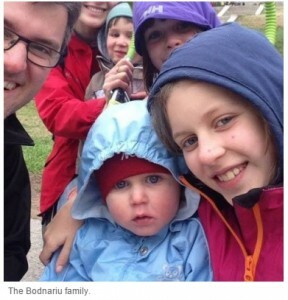 Image of the Norwegian / Romanian couple Ruth and Marius Bodnariu from Naustdal with their children. A family that Torp use for even coming into the center. They ran with violence, Torp did not mention this for yourself to get in the center. Here was a case that he could promote themselves and use to hide their ugly transgression as not suited to raise children according to what has emerged through what his children has released the book and article. Here is Torp really a man that the matter between me and him which he distorts the truth. In my case, there he constantly writes the same that I have written so and so much. But that 99% is written by his fictional review is something that he absolutely proven in conjunction with other criminals did not mention, such as police Manglerud. Torp itself should be very happy that it has only now come out which parenting he and Ann-Christin Torp had, now Ann-Christin Düring Woll. Had this been known before, so I am convinced that the CPS had not only taken the children of this couple. But they also had been punished for neglect! Then Torp's involvement nothing else than an excuse! Jan Aage Torp wants to be first, but he is disqualified to be all that he wants to be. First and foremost that he is re-married as believers, but also because there are so many testimonies against him. 1 Tim. 3. 2 An overseer must not be accused of anything. In Jan Aage Torp's case shotguns it into accusations, here it is overwhelming! We have his children that gives a poor image of Jan Aage Torp which it is possible to give of his own father. It is under minimum. I have not commented on what his children writes, I do not here either. Just note that this in itself is a strong testimony that Jan Aage Torp ought to have realized that his days as "Pastor" and "apostle" is over! The strongest witness burden that Jan Aage Torp should resign as "Pastor" and "apostle" is that he accepted 1.5 Million from a Serb who he described as ill afterwards. How can such be possible? He got them to sell their apartment, secondly give ca. 1.5 Million to themselves and Oslo church. What makes Torp further? When he is confronted with this he says he should have the money for themselves that this mockery apostle he is. Moreover reviews Torp who sick, indeed worse, rather ill for the draw that here all hope is gone! 3 Jn. b. 9 I wrote some words to the congregation. But Diotrephes, who loves to be first there, do not want anything to do with us. 10 When I come, I will make sure he is reminded of what he has done! For he drives with malicious gossip about us. But he does not stop there. Although he refuses to receive the brothers, and when others will do it, he forbids them and puts them out of the church. 11 My dear, do not do evil role model, but good! He who does good is of God. He who does evil has not seen God. 12 If Demetrius has all just good to say, yes, the truth itself testifies for him. So do we, and you know that our testimony is true. Here we meet two people, it is the evil Diotrephes and the good Demetrius. Note that this is like a striking resemblance between me and the evil in Jan Aage Torp. To write an article about this and really wants to publish a book about me and Jan Aage Torp? I really want, we'll see what that adds to settle and what God wants! Will also sure to lay out some of the articles I've removed over again, when the phenomenon January Aage Torp is very informative and interesting if he days that publicly proclaims is obviously spoke! He is and remains to be extreme, unscriptural and self-centered. Everything revolves around him, not Jesus or anyone else. It is this that is a classic example of a dummy last, a false apostle and an unfit Pastor, and obviously also Father about this comment I do not!